Emissivity measurements carried out with the VIRTIS instrument aboard the European Space Agency's Venus Express spacecraft indicate that Venus has been volcanically active in recent geological times. This result, reported in the 8 April issue of Science, has important consequences for the understanding of the geological processes at work on the planet. Venus, the second closest planet to the Sun, is covered by dense clouds and a thick atmosphere composed mostly of carbon dioxide, which make it impossible to observe the surface at visible wavelengths. Until Venus Express entered orbit around Venus in April 2006, information about the surface of the planet was primarily based on the radar and gravity measurements carried out by the Magellan probe, in the mid-1990's. These showed that Venus has been volcanically active in the past, and in particular they identified a number (nine) of hot spots, elevated areas exhibiting volcanic signatures above mantle plumes. But could these hot spots be indicative of recent, on-going, volcanic activity? The Magellan data could not be used to determine this. The Venus Express Visible and Infrared Thermal Imaging Spectrometer (VIRTIS) measures the spectral emissivity of the surface of Venus in a waveband (around 1 micron) that is weakly absorbed by the atmosphere of the planet. The spectral emissivity is the ratio of the radiance measured from the surface to the radiance that a black body at the same temperature would emit. Variations in emissivity relate to variations in chemical composition, and provide a means for remote mineralogical mapping. This in turn can be used to determine if the volcanic flows in the hot spot regions are consistent with relatively recent volcanic lava flows. 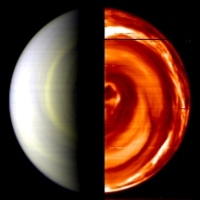 In the 8 April issue of Science, Suzanne Smrekar, from the Jet Propulsion Laboratory, and co-authors report on an investigation into the surface properties of Venusian hot spots in which they have overlaid the emissivity maps from VIRTIS on radar images and topographical maps of the surface of Venus, and concentrated their attention on the emissivity data from the hot-spot areas. Here, and in particular around three of the hot spots (Imdr, Themis and Dione Regiones), VIRTIS data show anomalously high emissivity values. These are interpreted to indicate that the lava flows observed in these regions are relatively recent: it is in fact known from studies of Earth basalt and laboratory experiments reproducing conditions on Venus, that weathering phenomena lead to an overall decrease of the emissivity of the basalt, and that this process occurs at a relatively rapid rate. Given the uncertainties on the chemistry at work on Venus, Smrekar and colleagues conclude that emissivity data and the weathering experiments support evidence that the flows observed are relatively unweathered and therefore recent, but that the uncertainties are too large for the emissivity data alone to provide a clear age constraint. 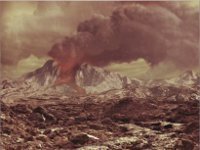 There are two very different end member models of how Venus resurfaced: either it has experienced essentially constant volcanism or it underwent a global resurfacing event about 500 million years ago. 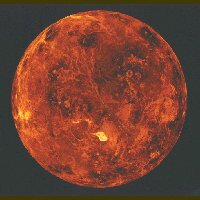 Based on the size and distribution of observed craters on the surface and Monte Carlo simulations of the process, it is possible to derive a range of plausible volcanic emplacement rates for Venus, that is, the rate at which new material is deposited on existing geological features, thus hiding them. From a range of plausible rates, and the size of the flows with anomalous emissivity, the authors are able to bracket the age of the anomalous flows to between 250 years and 2.5 million years, with values from a few thousands to a few tens of thousands of years being the most probable. 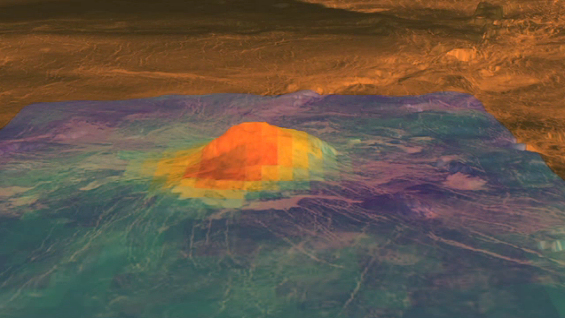 Venus is covered with volcanoes, but are any of these active? Determining how recent the volcanic activity has been, or if it is occurring right now, gives scientists an important handle to understand how the interior of Venus works, and how it affects the atmospheric composition and the evolution of the climate on the planet. The reported analysis of the VIRTIS data by Smrekar's team indicates that a number of lava flows on Venus are very young, and that most likely the planet is currently volcanically active.